AUSTRALIAN livestock industries still have a long way to go in the area of risk management, the Australian Farm Institute’s Mick Keogh told a rural property gathering in Brisbane this morning. 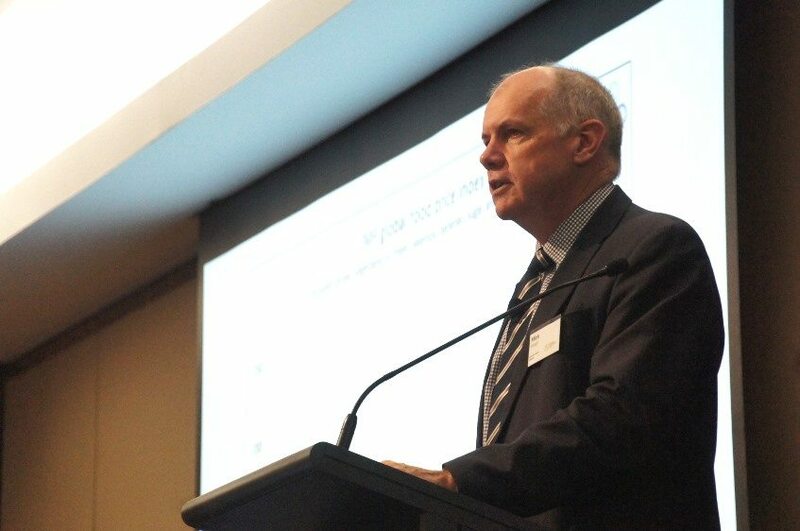 Speaking at Herron Todd White’s annual rural property update breakfast, Mr Keogh identified better approaches to risk management as one of four key future opportunities to lift performance for Australian livestock producers. 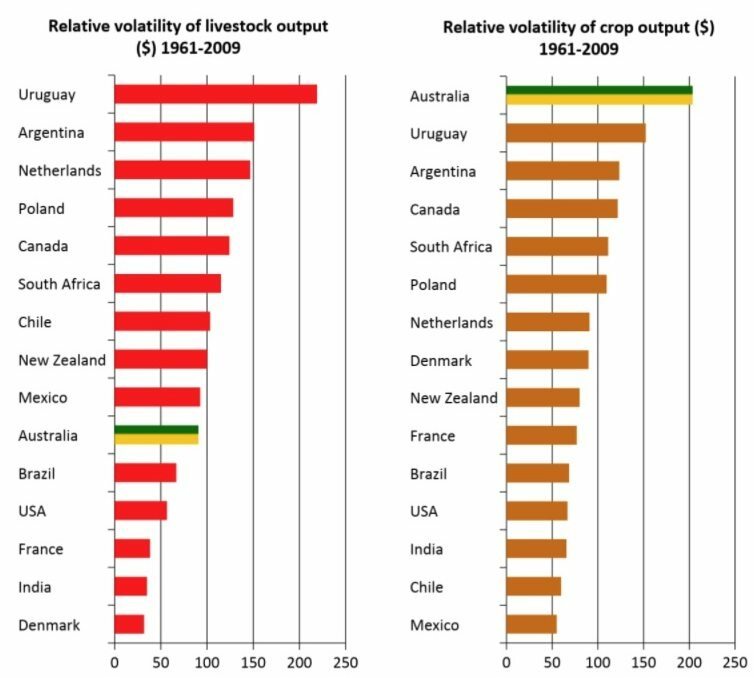 In the two graphs published here, he illustrated the degree of volatility of livestock and crop output across 16 countries. The measurement was based on the growth of output from the industry in dollar terms, and measuring the average standard deviation around that figure, covering the period 1961-2009. The bigger the standard deviation, the bigger the volatility – and the bigger the risk involved. The graphs showed Uruguay had the most volatile output in terms of livestock, with Argentina (heavily influenced by political decisions surrounding limitations on exports) second. “Australia wasn’t too bad, being just under 100, the average for the livestock index,” Mr Keogh said. He agreed that it was somewhat surprising that Australia did not figure higher on the livestock volatility list, given its heavy export and currency exposure, high seasonal volatility and subsequent cattle price variation. “I think the reason is that the ‘livestock’ category in this calculation included fed and pasture cattle, pork, poultry and lamb. It appears that collectively, they acted as a bit of a ‘buffer’ to a more extreme result for Australian livestock,” he said. In contrast in the cropping index (second graph, below), Australia was easily the most volatile for average annual output among the 16 countries surveyed. “Combining cropping and livestock, Australia has the second higher volatility for its agriculture sector of any of the countries. Only Uruguay was worse. It’s a stark reminder of something that many in the agriculture sector already know: that the risk factors in agriculture are certainly different than the rest of the economy, especially in Australia,” Mr Keogh said. 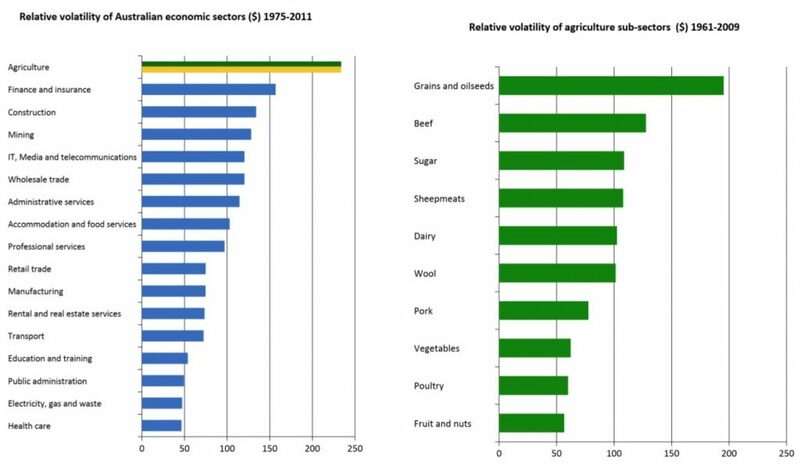 In another comparison of all economic sectors illustrated in this blue graph, agriculture was easily the most volatile of the 16 Australian economic sectors surveyed. Finance and insurance was a distant second. Within Australian agriculture itself (green graph), grains and oilseeds was ranked the most volatile in commodity comparisons. Beef was not quite as bad, but certainly highly ranking as well. “It’s a real reminder than managing risk is one of the real challenges that we face in agriculture here in Australia,” Mr Keogh said. Mr Keogh said while investment returns in Australian agriculture were equal to or better than returns in other sectors over the medium to longer term, investment risk in agriculture was also higher – especially in the shorter term. “That leads us to the recognition that risk management options are less well developed in Australian agriculture than overseas. “It’s a key challenge. If we could find ways to create better risk management options, we would perhaps bring about significant increase in investment, and new opportunities in the sector. Mr Keogh used the example of the corn belt in the US, where more than 60pc of the land was rented or leased. “That means young operators have the opportunity to take on a rental or leasehold arrangement to build some wealth, and eventually become owners of that property. The reason they can do that is that the US has a very substantial crop insurance program, whereby at a quite reasonable price, a grower can mitigate the risk of crop failure. Mr Keogh said this had downsides, in that new entrants to the sector had to have a much bigger bankroll before they could get started, and it tied-up a lot of capital that better risk-management options could allow to be used for other exercises (such as improvements), instead of just sitting there as a ‘bank’ for when seasons turned bad. “The development of commercial risk management system would encourage investment and new entrants,” he said. “Certainly we’re now starting to see the green shoots. Looking at the lamb industry, we’re seeing some quite significant forward contracting models now available, where a grower can secure a price three or four months out, with a riser-clause included so they don’t miss out if the market lifts. “That can be quite significant in terms of risk management, particularly if the lambs had to be fed to get them to weight. The beef feedlot sector also had some similar arrangements in place. “But I think there is a real opportunity there for unleashing more investment in the agriculture sector if we could get to the stage where those commercial risk management decisions are able to encourage new entrants. New models are needed to efficiently manage price risk,” he said.